This romantic dinner cruise is a must do for couples or lovers of sailing on your next holiday to Auckland. 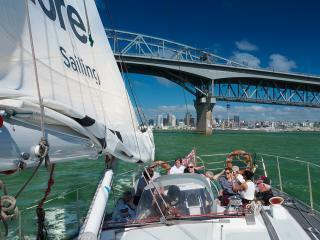 Pride of Auckland offer a fantastic sailing and dining experience aboard a 50 foot yacht. After a sumptuous dinner, the sails go up for an exhilarating return journey, overlooking the lights and sights of the city. Learn about the history of Russell (Kororareka), Paihia, Waitangi treaty grounds and the stunning 144 islands that make up the beautiful and historic Bay of Islands on a high speed luxury catamaran. 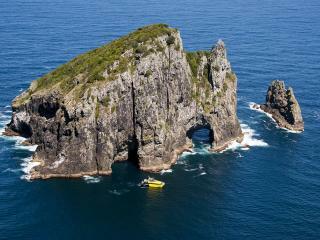 This 4.5 hour day cruise is an excellent way to explore the Bay of Islands and experience Cape Brett and the 'Hole in the Rock' on your next New Zealand holiday. Enjoy tea, coffee and and a sweet treat as you cruise Auckland Harbour aboard Pride of Auckland's 50 foot yacht. The experienced crew provide an informative commentary on this 1.5 hour cruise, so all you have to do is sit back, relax and enjoy the sites and sounds of New Zealand's 'City of Sails' - Auckland. See the sights of the City from the water and listen to an informative commentary on this one and a half hour cruise of Auckland Harbour in New Zealand. 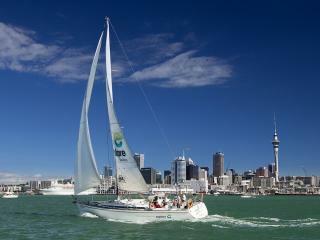 Experience the fun and pleasure of real sailing aboard Pride of Auckland's 50 foot yachts. This tour is a great way to see the 'City of Sails' from a different angle, whilst enjoying lunch and meeting new friends. Swim alongside dolphins in the beautiful Bay of Islands, and see the abundance of marine mammals and wildlife that this region is famous for. 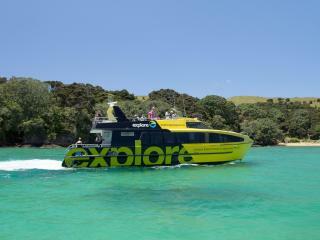 Travel on the high speed luxury catamaran with easy access for your breathtaking eco adventure in New Zealand.